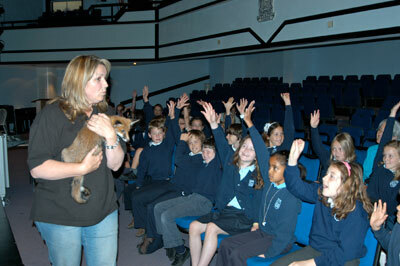 Lower School students present a cheque for £1,800 to Harper Asprey Wildlife Rescue. Students gathered for a special assembly in June to present Harper Asprey Wildlife Rescue (HAWR) with £1800. The money was raised at Mayfair, and students decided to surprise the charity representative, Anne Brummer, with their donation after she finished giving an educational talk about British wildlife in the assembly. Ms. Brummer thanked the Lower School for the donation and said the money would help many of the animals in her care. This charity is particularly special to the Lower School, as many injured birds and other wildlife have been found on the Thorpe campus and have been reported to HAWR. Subsequently, many of these rescued animals have been released back into the wild. After the assembly, excited students were able to interact with a selection of rescued animals, including: a fox cub, a baby doe, ducklings, a bat, and hedgehogs.